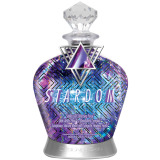 Designer Skin Stardom Dark Abyss Elixir and GlowGevity Complex. Designer Skin's darkest and longest lasting combination of bronzing ingredients. Dark Abyss Elixir for flawless extended color. GlowGevity Complex draws moisture to skin to ensure a beaming glow. Sumptuous Silicone Blend with Stargaze Flawless Finish.